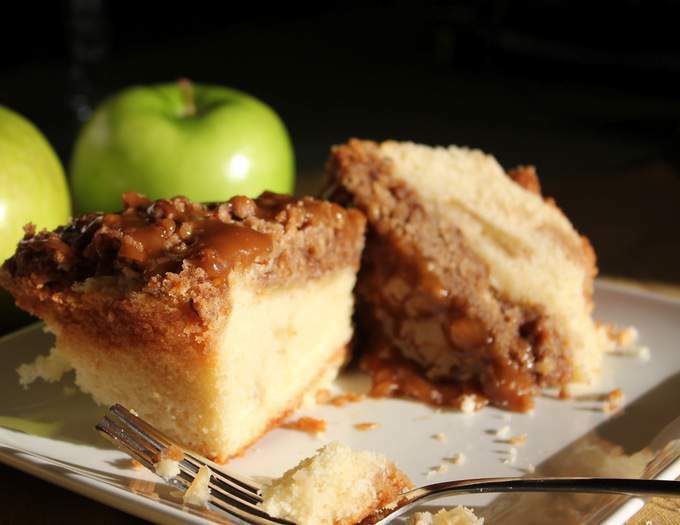 I love, love apple cake! 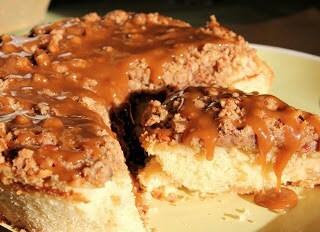 This is a dense pound cake type with tons of topping and homemade caramel sauce. 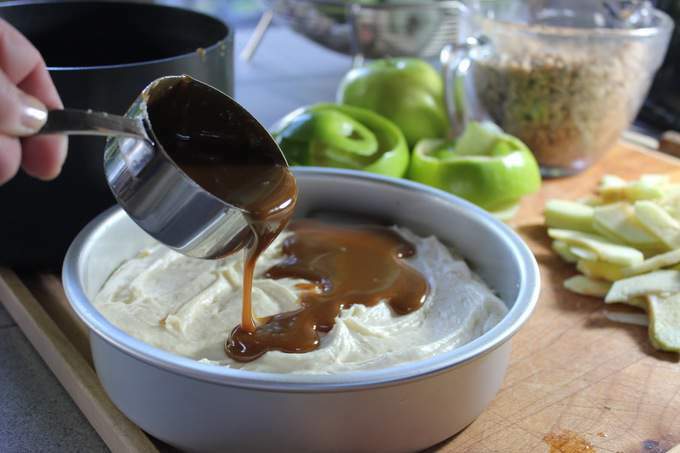 I think you could easily use store bought caramel sauce and save yourself the time…but it’s kinda cool to make your own! Let me save you some time on this cake. I learned it the hard way and was all over the kitchen trying to put this together, when it fact it is just 4 easy steps. Follow in this order and you will bang this out in half the time that I did…and probably make half the mess. Sounds complicated…but it’s not at all. Your just preparing one part of the cake, while other parts of the cake are cooling. Another hint, do not substitute a 7″ Spring Form Pan for a 9″ or you will have a mess in your oven…wonder how I know ??? I managed to save the cake but it took a little bit to get a decent picture of it. I think you could easily substitute a 9×9 square cake pan. Since I wrote this in 3 sections, it’s a bit difficult to get a decent ingredient list so I’ve listed the ingredients below. Preheat oven to 350. Peel and slice 3 Granny Smith Apples. Set aside. Mix it all up in a saucepan. Heat to boiling and boil 2 minutes. (note: Do not boil more than 2 minutes or your caramel sauce will harden when poured on your cake) Set aside to cool and prepare topping. Mix until well combined and set aside. 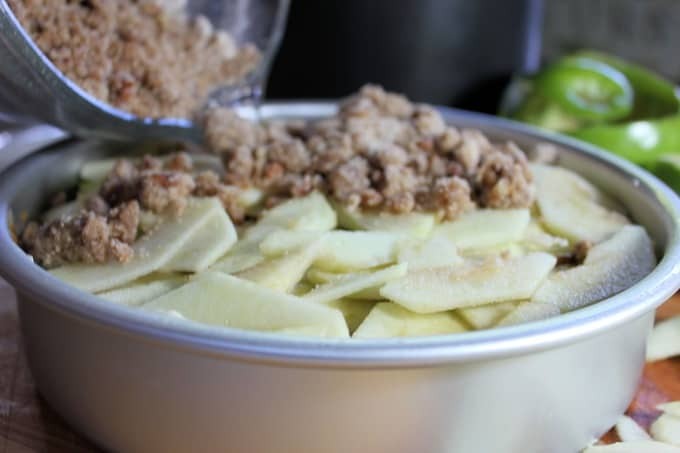 As the butter cools down it will harden the topping so you can crumble it easily. Beat butter at medium speed until creamy. Add sugar, beating well. Add eggs one at a time until well combined. Add remaining ingredients, flour, baking powder, salt, milk and extract. Pour into 9″ Spring Form pan. Pour 1/2 cup of cooled carmel sauce over cake batter. Top with sliced apples, then crumbly topping. Bake at 350 degrees for 45 minutes. Cover loosely with foil to prevent excessive browning and bake an additional 25-30 minutes. (a wooden toothpick will come out clean). Cool for 30 minutes and top with the remaining caramel sauce. I made this cake last night. It’s the first time that I made caramel and I appreciated your caveat about “don’t boil this for more than two minutes”. 🙂 I’m the kind of person that needs details like that. The topping is awesome and I’d make it again but I would find a different, lighter, moist cake for the bottom. Possibly something that uses yogurt. I found the cake quite “pound cake like”, as you say in your introduction to the recipe….leaning to the dense and dry side. 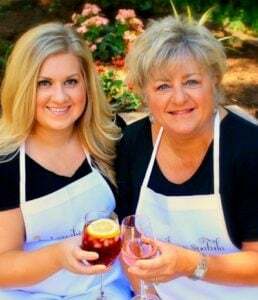 Love your blog and can’t wait to try more recipes! One thing that I like about your blog is your age – I find that many food bloggers are 20 or 30-somethings who are still a bit “green” on the baking /cooking side. I like that you’re older, wiser, more experienced and truly doing this for the sheer passion and fun of it — sort of a mamma figure to go to for recipe advice. You just totally made my day! Glad you like the cake and stuff but even happier you find my age to be a benefit! There are tons of 20 something bloggers out there and they are killer with a camera and know all the social media tricks that quite frankly…I fall short on. But you can’t take away 30 plus years of experience in the kitchen and I sure got that! Thanks for making me smile! Hi Jamie – I think it gives it a high gloss..it was particularly smooth too. Kathi, this looks great! I have a question. 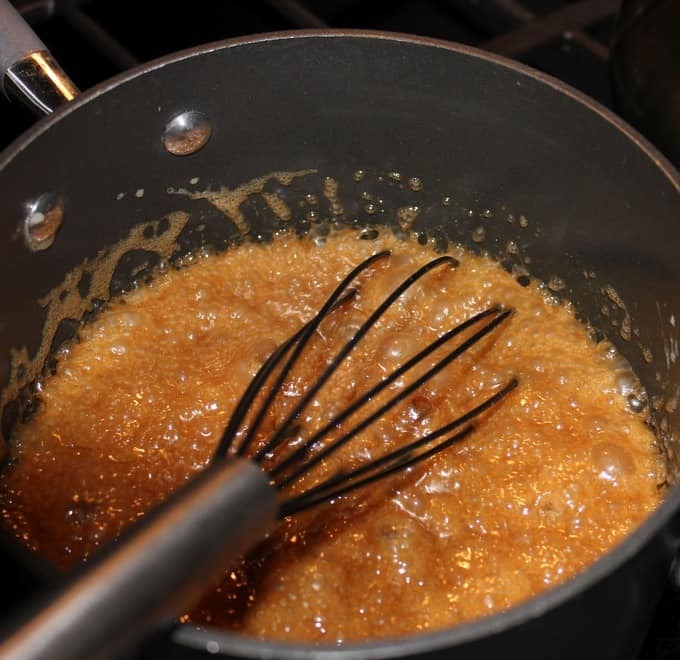 I make caramel sauce too, but don’t use honey. What does the honey do for the sauce? Just wondering…..